Send a smile with this quick card! The Screen Shadow makes it easy to create a background in a jiffy! Ink part of the Screen Shadow image with Soft Pool Shadow ink to create a sky, and Soft Leaf Shadow ink to create a hill. Stamp on white cardstock. Stamp the Smile Tree image with dark brown ink. Use color pencils to define the hill, add grass, and color the leaves of the tree. Distress the edges of the stamped piece with a paper edge distress tool, or use scissors. Adhere the stamped piece to a Crimson Notecard and trim. 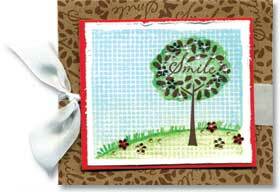 Stamp the edges of a Kraft Notecard with the Smile Tree and brown ink. Tie on the ribbon, then adhere the stamped piece with foam tape. Add Assorted Crystal Gemstones and Sparkle Gems Small Blossoms. Use Shadow Inks to create soft backgrounds.